The humble continuous loop. You’ve seen them—they’re nearly ubiquitious on hammocks these days, especially simple, gathered-end hammocks, but also all-in-one hammocks with integrated bug netting. Before you toss that small loop away, I want to describe and show some simple hammock suspension options that take advantage of this little workhorse. I’ve tested many hammocks, and the more I try, the more I’m finding the value in these short rope stubs. In fact, I would argue that these loops offer the greatest versatility for hammock suspension for both beginner and advanced users alike. The rope loop first offers a basic necessity on Brazilian-style hammocks by gathering up the ends, creating the basic hammock pointed oval (marquise) shape we all know and love. Probably my number one reason for using these loops is to create an attachment point as close to the hammock as possible. In this way, the attachment point is more likely to remain covered by the tarp in the rain, and the attachment can double as a water break or drip line, preventing water from running down the suspension line into the hammock. When circumstances bring you between trees that just barely clear your tarp, you may find your suspension is too long to be useful. In these cases, it’s nice to have a connection point close to your hammock to make hanging your hammock easier. 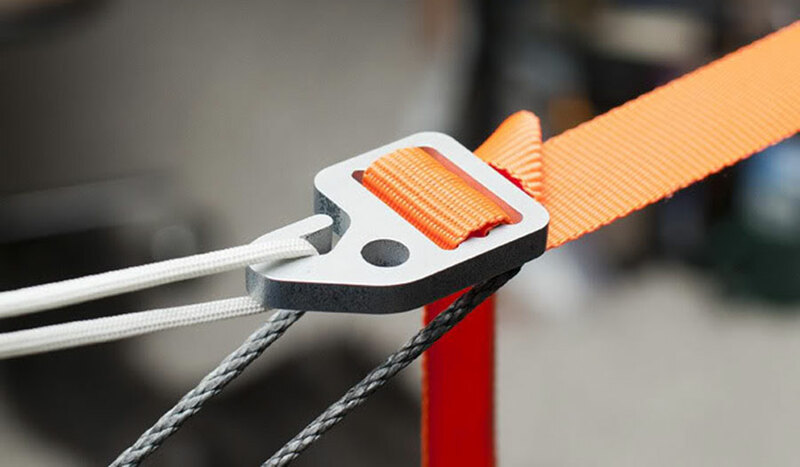 With the right connection options, such as a Whoopie Hook or Carabiner, a short loop makes quick work of setting up, just “clip” and go. Other hardware options are equally quick to adjust, such as descender rings, cinch buckles, or tri-glide-style devices. End loops provide maximum modularity options. Without making any changes to the hammock, you can slip on a new suspension option with ease. Quickly slip off a tri-glide in favor of descender rings or another option. 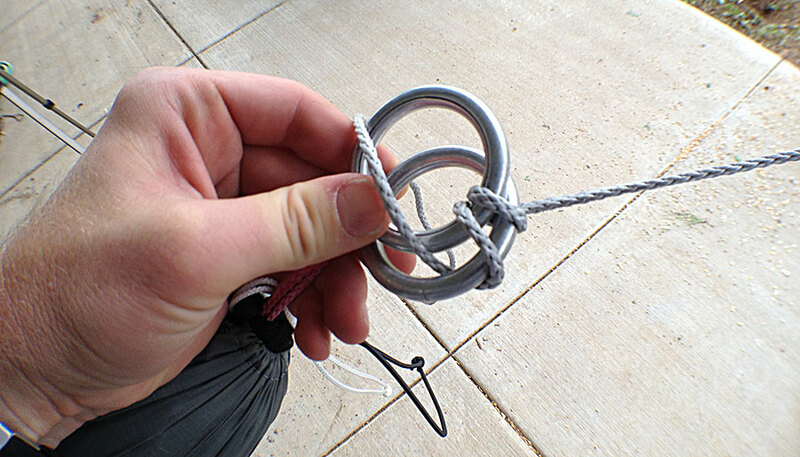 Even without hardware, a continuous loop can be used with a few knot options, such as the Becket Hitch. A nasty side-effect of hanging a hammock around trees is getting your suspension soaked in sap. With single-line suspension, such as straps that connect directly around the hammock and then wrap around a tree, you’re literally “stuck” with sap with no way to keep it away from the hammock. 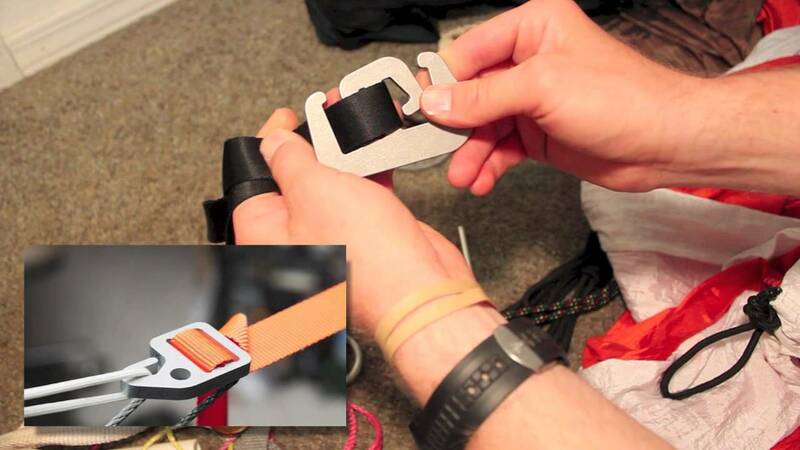 Using a short continuous loop on the hammock, you can easily disconnect a sappy strap and store it separately, if needed. Having a short loop provides a handy clipping point for under quilts. Clip either around the loop or through it for a secure connection. I prefer to clip my under quilt clip or hook through the loop for added security. To keep my pack off the ground away from the bugs and yet still covered by my tarp, I often clip it to the end of my hammock. I simply insert the pack’s hang loop on the top and insert it through the short hammock loop and use a stick toggle to hold it in place (a mini carabiner also works). With a short loop on either side of the hammock, you have perfect connection points to add a structural or non-structural ridge line to the hammock. Using 1.75 mm dyneema, you can tie off a ridge line that helps the hammock maintain a consistent sag shape, but also provides a place to clip a gear pocket for storing small items like flash lights, cameras, and phones. For this “wrapped descender ring” version, see my post on no-knots, lighter descender ring suspension. These “triangle” cinch buckles were assembled directly on to the continuous loop, but you can add them separately with a Lark’s Head knot, similar to the other examples shown here. The Becket hitch works great (maybe best) with a strap as the suspension line. You can use a modified double Becket Hitch with slippery line like Amsteel so it grips better instead of just slipping through. Note: DO NOT USE the Becket hitch with Amsteel/Dyneema on both the end loop and the suspension line. Dyneema is too slippery and will pull through. However, Dyneema with another rope, as in this photo, does work. Be sure to test for slippage prior to going into the field. Note: This eye on eye toggle also works best with two different types of rope, not Amsteel on Amsteel. However, you can use Amsteel on both the line and loop provided you tie it as illustrated above with the loop pushed through the suspension line, then the suspension line pushed up through the loop to accept the toggle. Stick toggles should be finger size and firm (some wood gets brittle or soft when wet). Keep up the great work from an avid follower. Excellent and comprehensive! Thanks. As an old time hammock user, still using my original Hennessey converted to side entry by simply hand ripping the netting out, best for me in Sierra, I’m following your hammock threads with great interest. One day soon I’ll be updating to the latest cottage industry designs. Need much lighter underquilt and rain fly! Meanwhile have added the Dutch hooks and whoopee slings which are better, but you’ve given me a new idea to try, the becket hitch. I guess backpacking hammocks are finally taking off, as they should IMO. Still only specialized sources like yours for info. No mention in Backpacker Magazine usually, just tents and more tents. Thanks for your support Todd! One day I may have to convert my Hennessy to have a zippered bug net (the bottom entry gets tiresome). Still, it’s fun to use on occasion. I’ve been testing that Becket Hitch a lot the past few weeks to see what works and what to recommend. Most poly and nylon ropes seem to hold fast and work well. Amsteel, which is a favorite material for hammock hangers, is so slippery that buries, splices, and hardware work the best; however, I have had success with the Becket Hitch with Amsteel if I wrap it 3 times. Let me know if it works for you. I’m just getting started with hammocks (self and kids). I have your book and appreciate all the good info there and this video as well. I have some 1.9oz ripstop and want to make some hammocks. What kind of rope or cord is used in a channel hammock for the continuous loop? I am thinking of using a polypropylene tree loop, then attaching Amsteel with a loop on the end to the polypropylene tree loop and then using a toggle to attach the other end of the Amsteel to the continuous loop on the hammock like you showed in the video. (but want to avoid the amsteel on amsteel attachment). Thank you. Thank you, and you’re welcome! If you buy some stock hammocks, like from Grand Trunk, ENO, Hammock Bliss, or Kammock for example, they all come with end loops that work just fine as-is. Some of the techniques I showed in the video may not be the easiest for starting out, but I’m happy you want to try them. For just beginning, I recommend getting a webbing strap that has daisy chain loops sewn in, like the ENO Atlas Straps or the Kammock Python straps. 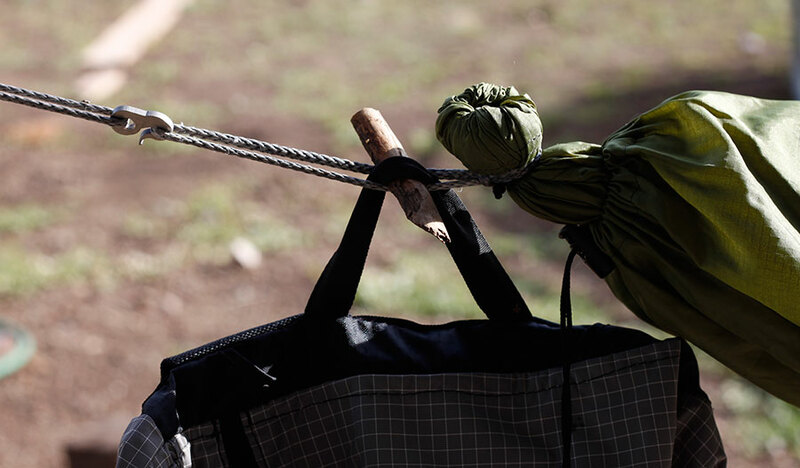 Then, with a carabiner, it’s clip-and-go from the hammock loop to the webbing. No knots to fiddle with or difficult adjustments. If you want to DIY, I would probably make a strap with an eye loop on one end and leave the other end open and use the Becket Hitch to tie an adjustment. A Becket Hitch on Amsteel with a strap works great too. Let me know if that helps, or if you want anything more specific. Feel free to email me too. Can you give some recommendations of rope to use to replace rope on my ENO, Grand Trunks and Yukon Bug net hammock for the kids? I like the idea of using a lighter/ stronger NON stretching rope. Any tips would be great. The small loops that come standard with ENO and Grand Trunk shouldn’t stretch too much (I still use mine), but if you want to upgrade them, the only thing I would recommend would be some 7/64 Amsteel loops. One place I know you can purchase them is from Arrowhead Equipment (he calls them “chain links“), but you can also make them. Thank you! I’m glad you are finding the site helpful. I’ll give a few thoughts here and then be sure to contact me at theultimatehang@gmail.com and we can chat more specifics. Generally speaking when weight limits are mentioned it is referring to safe working load, not breaking strength. This means that the fabric is probably 5 to 10 times stronger than what is listed. This gives a margin of error for unpredictable issues and dynamic forces (getting in/out; swinging, etc). Most hammocks won’t break until more than 1,000 lbs has been loaded. That said, there are a few hammocks with a stronger weight limit. And, when you say ‘jungle hammock’ I’m guessing you mean a hammock with a bug net. Unless he is concerned with how heavy everything is, you can always buy an external, separate but net that would work on any hammock. The Kammok Roo hammocks are reasonably priced and have a strong weight ratio. Email me for more examples. I love the idea of the continuous loop. Does a Whoopie Sling attached to the loop with a larks head still provide a water break or does there have to be a piece of hardware in between the two? Good question, Caleb. I’ve got a “science project” lined up when the temperature warms up to test all the different suspension options under rain conditions to see what water break works the best. From my own experience, I would say that a whoopie sling larked onto a continuous loop wouldn’t do the job as the two hitch too tightly together. What kind of knot do you use to make your continuous loop. Double or single fisherman knot. So… Can I use the Becket hitch with the stock cord and straps in place of the Hennessey lashing? It will hold and not jam? I’ve found that the Becket Hitch works best in the opposite way: use a rope loop on the hammock and use a longer webbing strap and tie a slippery Becket Hitch. This is what I’ve been doing with my Boy Scout Troop with great success. It is easy to untie: simply push back the loop toward the webbing and then pull the slippery hitch back through. No jamming. Tying off a Becket Hitch with the stock rope, especially if you have a Hennessy with the thin spectra line, it can be pretty hard to get it to hold. In my experience, a double Becket Hitch held better. What is important here is to make sure the bend will hold. Not all ropes grab well. I wouldn’t recommend this knot with Amsteel; it is just too slippery. Some of the Hennessy ropes are too thin and slippery, so I would gingerly test before applying all my weight. My personal preference with the Hennessy Hammocks is to tie a slippery clove hitch onto a climbing carabiner with a safety hitch. It is easy to tie and untie so it helps make adjustments a little quicker, and it doesn’t burn/melt the webbing strap. Send me an email if you want further clarification. Does anyone have experience using the JRB Tri-Glides like the “Dutch Buckle” (loop over the top, like the photo)? Looks like it might be the lightest “quick” attachment method available. I’m asking because it looks like the “Dutch Buckle” is no longer made. They work great. There are two basic ways folks use them: as a toggle or as an all in one. For an all in one, the webbing is attached to the hammock and the tri-glide is attached. You go around the tree and then feed the working end back through the tri-glide. Derek, this article opened my eyes! I can’t wait to test it all. Thank you very much! Thanks! I’ll get that fixed. I’m glad you enjoyed the article. I took about 2 ft of chord (like amsteel) and made a prussic knot on my hennessy expedition suspension rope. Then I hooked a caribiner into the loop end of the prussic knot. The prussic knot could slide along the suspension rope when there was no tension. As soon as tension was applied, it would grab the suspension rope and hold tight. To setup, I wrapped my tree-hugger straps around the tree, hooked my caribiner into them, slid the prussic knot along the suspension cord to tighten. Voila – seconds only to set up. The prussic knots lasted for years. Does anyone else have experience with using prussic knots like this? Great idea! Climbers use prusiks as a self belay device, so what you’re doing isnt uncommon. What’s worrisome is the safety factor. If the prusik were to slip you wouldn’t have a backup. I would also be sure the prusik uses a line safety rated for your weight. I never had the prussic slip. After hanging in my hammock, it sometimes took a bit of effort to get it to slide. It really grabs tight. I wrote Tom Hennessy about it a few years ago, and his response was that they thought it too risky from a marketing point of view. I can see that – you want to make sure there is absolutely no way you can get sued. However, like I said, this worked for me for years. My only caution is that you check your prussic rope regularly. Over time it will wear down due to chafing. Yes. That is one of my concerns as well. What cord do you recommend for making a tied continuous loop? I am going to be making hammocks with my scouts and I think they will have an easier time with the double fishermans knot than with the buries required for making one from amsteel. I agree with you. We built hammocks with our scout troop not long ago. I used 5mm accessory rope for the most part and tied Double Fisherman’s knots. We worked on the Textile Merit Badge as part of the experience. You can also use Amsteel and tie a Double Fisherman’s knot in it. This is what I did on my recent trip to Goblin Valley. Or, if you can get your hands on a discarded role of Muletape from your local power company, you can make inexpensive webbing loops by tying water knots. We also used the Muletape as our webbing straps and suspension systems and used the Becket Hitch as the secure yet easy to untie knot. It is one of the easiest methods that doesn’t require any extra hardware or expensive purchases. The scouts already know or understand the Sheet Bend knot, and the Becket Hitch is is tied the same way. I am new to Hammocks and it is being delivered today. My question is do you really need two Whoopie slings or can I still use the hardware that came with the hammock on one end and use just one whoopee slings to tension the hammock? You don’t need any Whoopie Slings 🙂 but you will need some type of suspension. And you’ll need suspension on both sides of your hammock. Without knowing more about what hammock you have it will be hard to explain in more detail. In order to balance and center your hammock between your two anchor points you’ll need some type of suspension on both sides, each able to adjust independently. The hammock is a hennessy expedition asym which comes with the tree straps, and your comment about balancing and center point is dead on, I will make two whoopee slings then and thank you for the very fast response!! Hi Derek! I’m a Derrick too. 🙂 So I’m just getting immersed in all this (amazing info here, BTW & your book is on it’s way) and I’m planning to put cinch buckles on my old HH Ultralite Backpacker… I’m a fly fisherman so I know a surgeon’s loop very well. Given that, can I simply take the existing HH line and tie a smallish surgeons (is a bowline better?) loop in it close to the hammock and use that? Or do I really need to take apart the end in insert an continuous loop in there? If it’s way more advantageous I’ll do it. As for these little loops going forward (I see needing a little bag of them for various things) will the surgeon’s loop/knot work fine, or should I learn another way to tie them? I could get a bunch of CL’s from a site too… but I’m still learning to trust a splice over a knot, haha! Anyway, thanks so much for all this amazing information. I’m a convert already just from reading. I wouldn’t use the surgeon knot for a continuous loop. 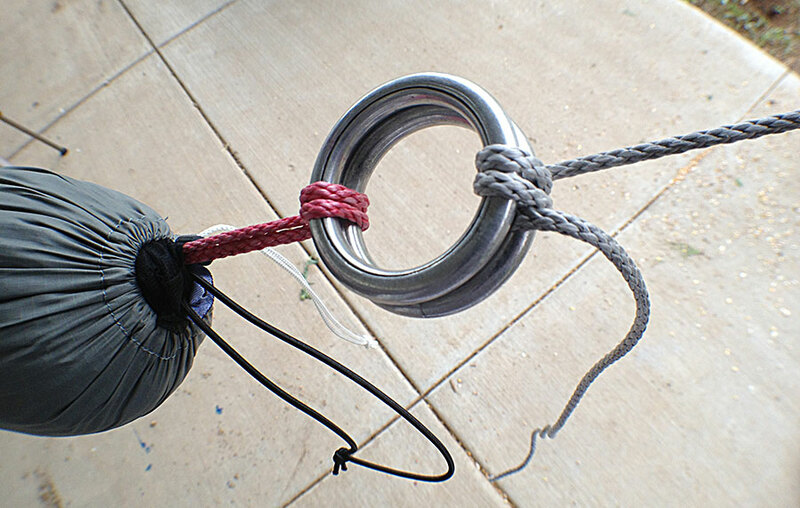 Tie the loop using a double fishermans knot and then attach the loop to the hammock. For the Hennessy, it is easy to remove the end cap where you’ll see how to remove the rope and feed through the new loop. Wrap the loop around and through the holes and back through itself. The end cap can attach back on using a zip tie. If you think you might switch the loop out for something else to try different suspensions, might I suggest using the Zeppelin bend rather than the double fishermans knot, as it is much easier to untie, even after bearing a heavy load. You can also feed through a bight rather than the ends of the rope as the last step in tying the bend to make it easier to untie, much like you show in your Becket hitch how-to video. In my experience, the Zeppelin bend works rather well with webbing and rope/cordage regardless of diameter, although I haven’t tried it with slippery Amsteel/dyneema cord. Thanks Kevin. I’ll give that a try. Hello.. Went out today and tested a becket hitch tied with mule tape to a new amsteel continuous loop I made. I was super excited until it slipped… It looks like it partially melted the line the amsteel line. Thought I had tied it wrong but went home and re-watched the vid above, it seems like the same knot. Any advice? Round 180lbs. Multiple wraps maybe?? Hmm. It shouldn’t have slipped, but the combination of mule tape (which is lubricated) and Amstel (which is really slippery) could be factors. Yet that is what I also use frequently. In fact I’ve been using it the past year and it’s what I use inside my house. Email me directly and send me photos. Let’s figure this out.